Made in Danbury: the $400,000 sports car? 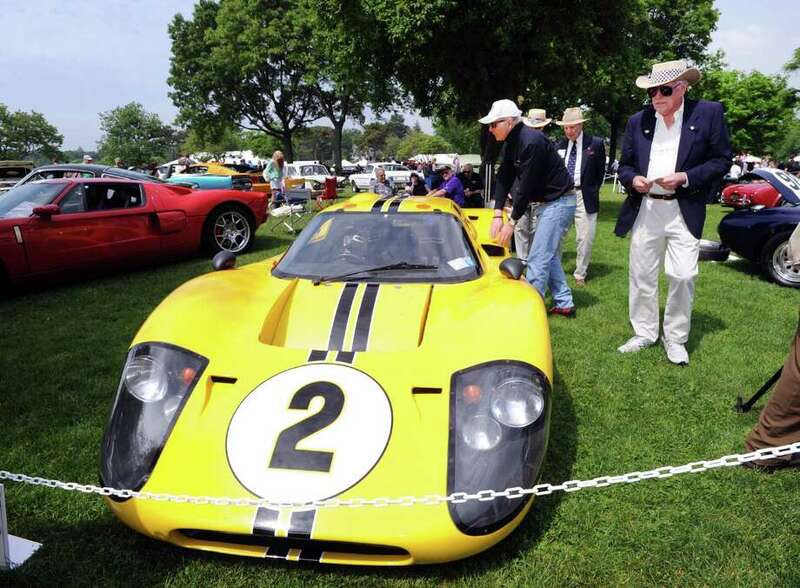 A 1967 Ford GT40 Mk IV J6 belonging to James Glickenhaus at the 2016 installment of the Greenwich Concours d’Elegance. From helicopters in Stratford and nuclear submarines in Groton to the “Locomobile” of bygone Bridgeport days, Connecticut has stamped its fair share of contributions to transportation history. As for a $400,000 sports car? That could be Danbury’s future claim to fame, if a filmmaker and auto enthusiast delivers on his vision. As first reported in early November by Autoweek and other trade publications, the performance auto designer Scuderia Cameron Glickenhaus has acquired a facility at Danbury Municipal Airport just south of Interstate 84, where the company plans to build manually its 004S and 006S series sports cars. The company is owned by James Glickenhaus, a film director and car collector who maintains an existing shop floor in Sleepy Hollow, N.Y. He has displayed his cars in the past at the Greenwich Concourse d’Elegance auto show held each spring and has committed to next year’s installment running May 31-June 2. In Danbury, Scuderia Cameron Glickenhaus has acquired a property dominated by a circular building where railroad locomotive turntables were once produced by Macton, which subsequently moved to Oxford. Highcroft Racing used an adjacent building to build race cars for competitions like the 24 Hours of Le Mans endurance race in France, with SCG a Le Mans series entrant itself. SCG confirmed its Danbury plans in a November newsletter to clients, stating that it eventually sees production levels hitting 15 cars a week at the new facility. Glickenhaus and SCG could not be reached immediately Wednesday by Hearst Connecticut Media to provide additional details on the Danbury facility. In a Monday post on Facebook, Glickenhaus stated that the Danbury facility is now on the cusp of renovations in preparation to produce vehicles. The National Highway Traffic Safety Administration has SCG last year under a 2015 federal law authorizing low-volume automotive manufacturers to sell cars in the United States. New York recently approved SCG’s application to become a dealer there — Glickenhaus posted a photo of the first SCG vehicle sold there — with the company seeking permission in California as well. With years of experience producing race cars, SCG is now planning a high-performance road model dubbed the SCG 004S that will cost $400,000 according to Autoweek, with the company taking $40,000 deposits on future deliveries. With a carbon-fiber chassis and a 650 horsepower engine beneath the hood, the SCG 004S looks every bit a race car, its driver’s seat positioned centrally beneath a bubble canopy windshield. The company touts the model as a “road legal race car you can drive to the track” and home again. SCG also plans a high-end, off-road vehicle, having yet to disclose whether it could be assembled in Danbury. In a CarCulture.TV interview recorded earlier this year at the Greenwich Concourse d’Elegance, Glickenhaus attributed his inspiration for building cars to his commissioning of a modernized version of a classic Ferrari race car he owned. The car had won the 24 Hours of Daytona endurance race, eventually piquing his interest in the possibilities of volume production. Those vehicles will begin rolling off production lines in Danbury in the coming year and beyond, if Glickenhaus brings that vision to fruition.